Ok stay with me here – I am not just adding pumpkin for pumpkin’s sake. Actually there is a lot of pumpkin in Mexican food, including a delicious dip made out of pumpkin seeds called Sikil Pak (a great way to use up the pumpkin seeds you roast after carving). Something about the earthiness of pumpkin goes really well with the heat and flavor of chili peppers. 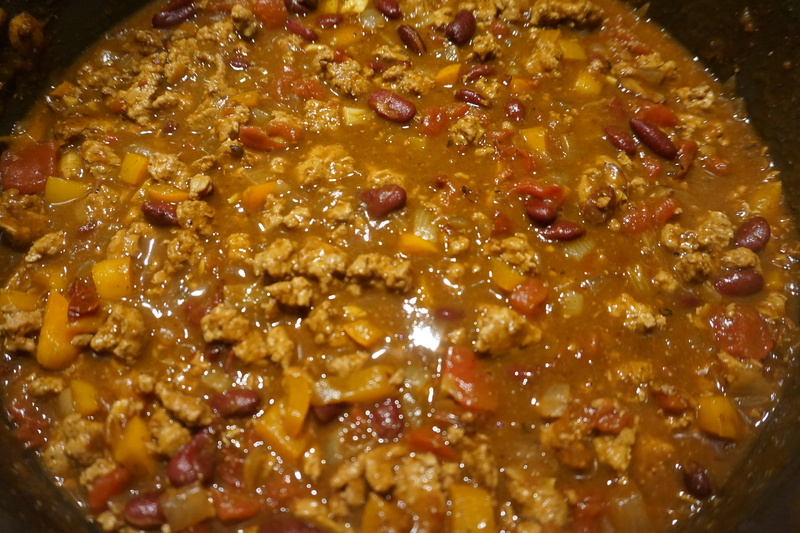 For this chili I essentially used pumpkin puree instead of crushed tomatoes as the base, if you didn’t know it was pumpkin you probably wouldn’t guess but it really does make this chili special. 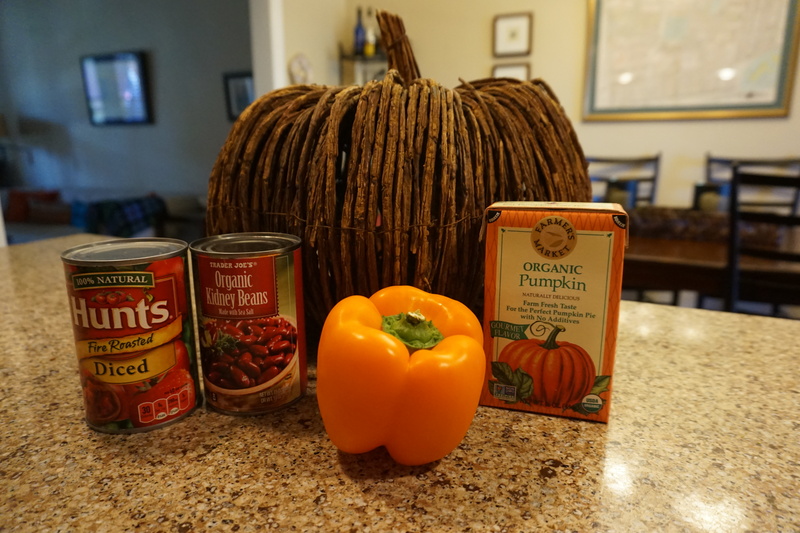 It also makes it perfect for Halloween as this chili can be made well in advance, even frozen, and then kept warm on the stove for a long time as you keep popping up and down to great trick o’ treaters. Pair it with the Peanutty Oatmeal Cookies and my Halloween cocktail on Friday and you will have a great meal all set (candy served of course as the appetizer, amuse bouce, palate cleanser and dessert). Heat a large dutch oven over medium high heat and add 1 tablespoons of the canola oil. Once hot crumble the ground turkey into the pan, being careful not to crowd it. Add salt and pepper but leave the turkey alone so it can brown. After several minutes use your spoon to break up any larger pieces and stir it around, cook for another 5 minutes or so until cooked through. Use a slotted spoon to transfer the turkey to a bowl and add the remaining tablespoon of oil to the pan. Throw in the chopped onion, pepper, garlic and chipoltes. Cook for minutes then add the coriander, chili powder, cumin and cayenne. 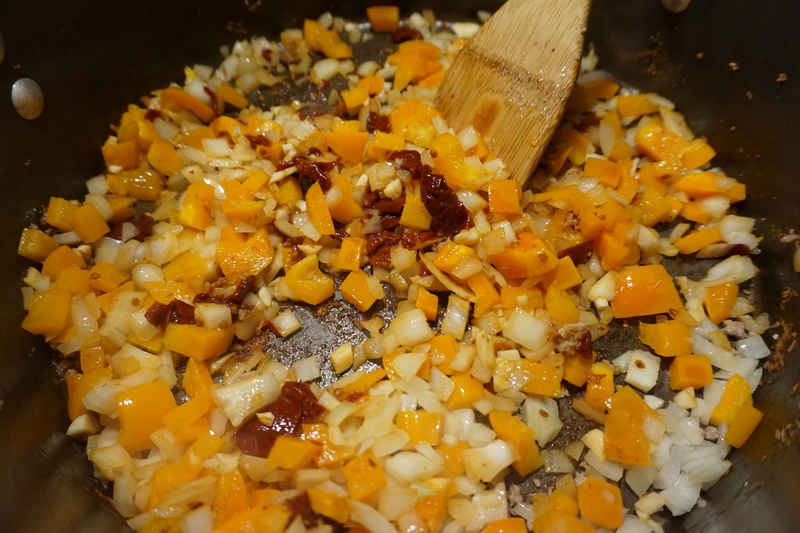 Cook for another minute, stirring so the spices warm through and coat the vegetables. Add the tomatoes and use the juice from the tomatoes to deglaze the pan. Return the turkey to the pan along with the beans, broth and pumpkin. Stir well until all combined and then bring to a simmer. Cook for 30 minutes, stirring occasionally until all the flavors have melded. Serve right away or let the chili cool and then freeze for up to 4 months. Heat a large dutch oven over medium high heat and add 1 tablespoons of the canola oil. Once hot crumble the ground turkey into the pan, being careful not to crowd it. Add salt and pepper but leave the turkey alone so it can brown. After several minutes use your spoon to break up any larger pieces and stir it around, cook for another 5 minutes or so until cooked through. Use a slotted spoon to transfer the turkey to a bowl and add the remaining tablespoon of oil to the pan. Throw in the chopped onion, pepper, garlic and chipoltes. Cook for minutes then add the coriander, chili powder, cumin and cayenne. Cook for another minute, stirring so the spices warm through and coat the vegetables. Add the tomatoes and use the juice from the tomatoes to deglaze the pan. Return the turkey to the pan along with the beans, broth and pumpkin. Stir well until all combined and then bring to a simmer. Cook for 30 minutes, stirring occasionally until all the flavors have melded. Serve right away or let the chili cool and then freeze for up to 4 months. This is awesome. Do you think I could make turkey meatballs and put them in a crock with pumpkin sauce?? I wanted to do meatball apps for trick or treaters this weekend and this would be an awesome twist!!! absolutely – report back and let us know how it goes!